As a conservative who believes in individual responsibility, limited government, free markets, caution in making social changes, and a robust foreign policy, all my adult life I have been a Republican and (with the single exception of an eccentric race for attorney general in Philadelphia, when the Democrat was tougher than the Republican) I always vote Republican. But the Republican presidential primary of 2016 is unlike any other because the most popular candidate – Donald J. Trump – not only ignores conservative values but, to put it delicately, lacks the knowledge, experience, dignity, and character to serve as president of the United States. In this spirit, along with 120 others, I signed a Mar. 2 "Open Letter on Donald Trump from GOP National Security Leaders" that asserted we "commit ourselves to working energetically to prevent the election of someone so utterly unfitted to the office." I wrote an article for the Philadelphia Inquirer titled "There's a Name for Trump's Brand of Politics: Neo-fascism." I regularly tweet with the #NeverTrump hashtag. Opposing Trump goes without saying; but whom to support? (To be clear: Support personally, unconnected to the non-profit I head.) Other than Trump, I could have endorsed any of the original 17 Republicans (yes, even Chris Christie). But because the field was so large and confused (remember when Scott Walker led the pack? ), I hung back, waiting for the emergence of a clear alternative to Trump. Sen. Cruz clearly became that alternative when Marco Rubio withdrew. Stating that he would tear up the Joint Comprehensive Plan of Action with Tehran (a.k.a. the Iran deal) on his first day as president. 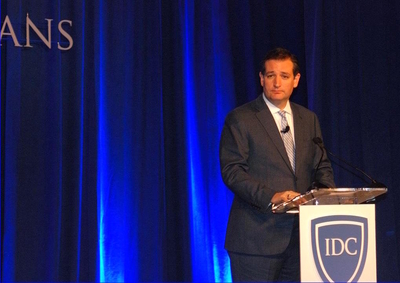 Sen. Ted Cruz at the "In Defense of Christians" conference - before he walked off the stage. Standing up against the acceptance of large numbers of insufficiently vetted Syrian refugees into the United States. Specifying that what too many other politicians euphemize as terrorism and violent extremism has an Islamic component. Calling to "empower law enforcement to patrol and secure Muslim neighborhoods before they become radicalized." This is a particularly delicate topic; his bold stance, then not backing down under a barrage of criticism shows unusual resolve and courage. Mr. Pipes (DanielPipes.org, @DanielPipes) has worked for three U.S. presidents in five administrations. © 2016 by Daniel Pipes. All rights reserved. July 22, 2016 update: I explain here the timing of this endorsement.